One thing you soon learn on a Tasimba safari experience is to take the time to look deeply into this wonderful new world you’re immersed in. Yes, we are but travellers passing through, but for 7 incredible days we get to live off the beaten track in a vast, pristine, untamed wilderness with some of the coolest animals on earth. Driving along in an open jeep our heavy tires meander easily through the deep Kalahari sand. There are no other vehicles in sight, no planes overhead, no sign of civilization in any direction. Breathing in all that fresh air is a heady feeling and, when combined with no modern sounds except the quiet conversations of your fellow passengers, for the first time in a long time you feel completely relaxed and settled into a serene world of wonder. 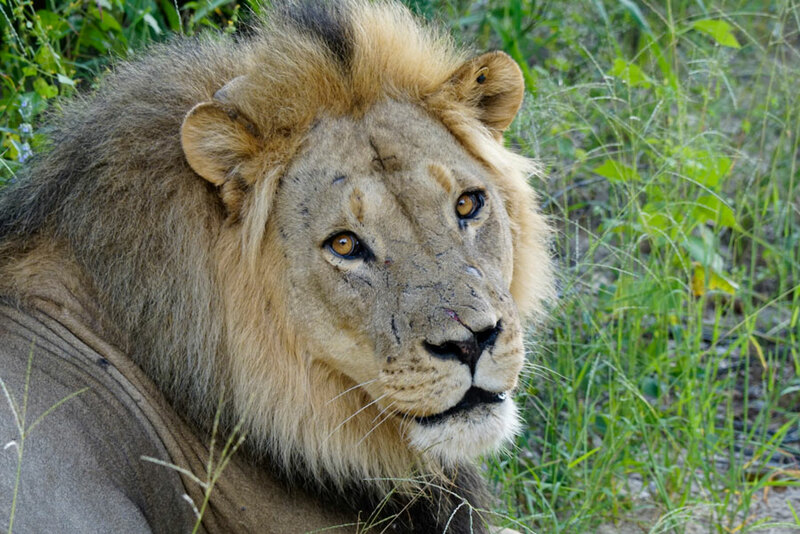 On one of our afternoon safaris a few years ago, just around a slight bend in the road, we came across Xanda, eldest son of the famous 13-year-old Cecil who was unconscionably lured out of the Park and brutally killed by a hunter in 2015. We knew Xanda, who weighed in at about 400 lbs, is a predator who will soon be looking for his next meal. Quietly though, we sat and watched this magnificent creature mere yards away. But in the moment, looking deep into those tawny eyes all I could see was the glorious colours of the setting African sun reflecting back. I didn’t stare at the scars that marked his face, the size of his giant padded feet, his soft pink tracking collar or the sharpness of his razor-sharp teeth when he yawned. Instead I focused on his eyes, liquid pools filled with wisdom as head of his pride. As King of the Jungle what tales he could tell! Devastatingly, a few months after we took this picture in 2017, he met the same fate as his father and brother – death at the hand of a trophy hunter. Frequently on safari, we come across large herds of elephants. Protective of their young, the females gather around the little ones but otherwise are laissez-faire about our presence. Perhaps their sheer size and numbers against our one lone jeep of gawkers cause them no concern. It’s not until a giant- sized matriarch turns and, taking a step forward, looks deeply into our eyes. What beauty! 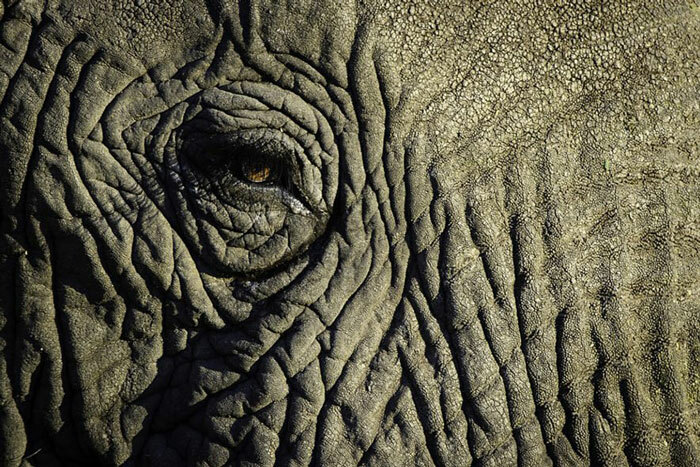 Under long fluttery lashes, amidst saggy, wrinkled skin a soulful eye stares back. We are no threat to her. The wisdom of the ages courses through her veins and without a backward glance she saunters off. There is no sound from her or her young as they majestically, softly, pad away. The experience is breath-taking! As we continue on our drive, we pass through a wooded area that is home to many of Hwange’s 106 wildlife species. Branches snap, leaves rustle and there before us is a big eared, white rimmed snout of a young, leggy kudu looking back at us. Mesmerized we watch, we wait and before long he wanders off in search of something far more interesting than us. Bursting out of the forest into another open, grassy area we find ourselves weaving in between herds of wildebeest, zebra, giraffe and many more elephants. 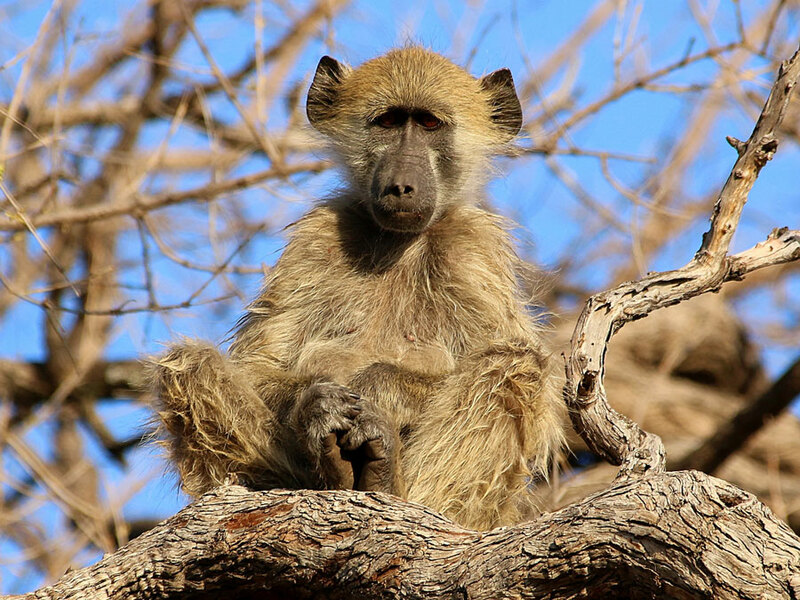 Black backed jackals busily trot across the path while troops of baboon scamper all around. We draw up beside a great tree with gnarly branches and notice that looking down on us is this little furry friend. So human like that one can’t help but wonder as we gaze into his teak-colored eyes, what must he be thinking about? Again, we find ourselves lost in the moment, but incredibly happy to have found this special time, this incredible place. Tasimba invites you to look deeply at every aspect of this wonderful experience. Here, the allure of nature is so mysteriously powerful, so enticingly strong. Having 7 days immersed in a wilderness teeming with wild and birdlife is just one of the many reasons to book your Tasimba experience now. Come, join us. Just open your eyes and see how beautiful life is. Why don’t YOU join all of our great guests this fall? It will be the trip of a lifetime – and so much more than just a safari! We look forward to welcoming you on a Tasimba trip! Contact us about our next safari. We’d love to have you join us! (Corporate and group rate packages also available). next post: Who’s Watching Who?